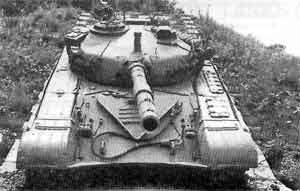 In 1977, Yugoslavia decided to build the Soviet T-72 MBT under licence and by 1979 all of the documents and drawings required to build the tank had been received. The next two years were spent carrying out detailed changes to the drawings to suit local manufacture and incorporating some Yugoslav equipment, especially in the turret. There were some 240 main contractors involved in producing the M-84 in Yugoslavia. Yugoslav-built prototypes were completed in 1982-83 and production got underway in 1983-84, with first production vehicles being completed late in 1984. By early 1991, it was estimated that some 500 had been built in Yugoslavia under the designation of the M-84. 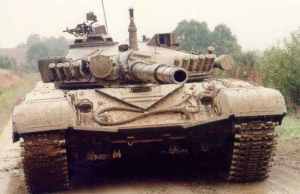 Prior to the commencement of local production, Yugoslavia took delivery of approximately 50 T-72s from the then Soviet Union enabling troop training to get underway. 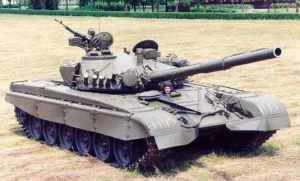 Although the M-84 is based on the Soviet T-72 MBT, many improvements over the original have been incorporated to meet the requirements of the Yugoslav Army. Production of the M-84A, which contains a number of significant improvements over the original production M-84, commenced in 1988. The Yugoslav M-84 resembles the T-72 only in outward appearance. There are minor differences in the external features of the turret, with a bank of six electrically operated 81 mm smoke grenade dischargers either side of the turret and a meteorology sensor pole on the forward part of the turret roof to the immediate rear of the 125 mm gun; the absence of infrared searchlights and the sighting device case indicate significant differences inside the turret, particularly in respect of the fire-control system. The M-84A has a computerised fire-control system, ballistic data sensors and a day/night sighting device incorporating a laser range-finder and second-generation image intensifier. In addition to the new fire-control system, the M-84A MBT has better armour protection and numerous other improvements including a V-46TK V-12 diesel developing 1,000 hp which gives a better power-to-weight ratio than that of the T-72 and therefore superior mobility. Recent information has indicated that production of the M-84 may once again be under way in Yugoslavia and that, in addition to the known sale to Kuwait, sales may have been made to Libya and Syria. The first production M-84 ARV, designated the M-84 ABI, was completed in December 1994. 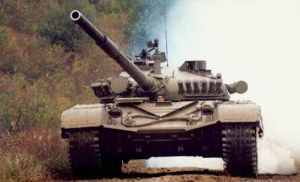 The concept of battle tank M-84 is based on russian tank T-72 while retaining its main properties: largest applicable gun caliber and efficient ammunition, automatic gun loading, small mass, low profile and top quality armour protection. 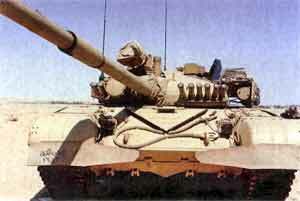 Simultaneously the battle tank M-84 represents evolution of the basic tank T-72 in systems and properties in which T-72 was technically inferior to its Western counterparts: new modern Fire Control System, modified motor with increased motor power, new radio equipment and new NBC detector. All subsequent modernization novelties carried out on T-72 in several countries and real war experiences with M-84 confirmed this approach in design of battle tank M-84. 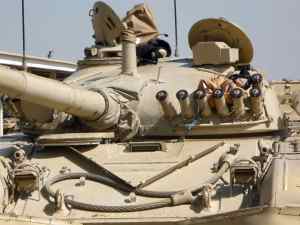 The basic armament of M-84 tank consists of smooth bore main gun 125 mm with firing range of 360° and 6°13' / +13°47' on height. Explosive-piercing ammunition (TF, HE), designed for annihilation of light fortified objects, non-battle vehicles and infantry, mass 33 kg, initial speed 850 m/s and targeting distance of 6000 m.
Cumulative ammunition (KM, HEAT), designed for anti-armour battle, mass 29 kg, initial speed 905 m/s and targeting distance 4000 m.
Sub-caliber ammunition (PK, AP-FSDS), designed for anti-armour battle, mass 19.7 kg, initial speed 1785 m/s and targeting distance 4000 m.
Machine gun PKT, caliber 7.62 mm, coupled with gun, with targeting distance 1800 m achieves real firing speed of 250 bullets/minute; battle set consisting of 2000 bullets. Antiaircraft machine gun NSV caliber 12.7 mm mounted on the commander turret and manually controlled for 360° in direction and -5° / +75° on height with targeting distance of 2000 m achieves the real firing speed of 680 to 800 bullets/min. The battle set consists of 360 bullets. 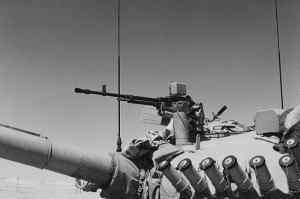 Other miscellaneous weaponry in tank consists of signal pistol, hand-grenade and personal weapons of the crew. Stabilization of targeting line and bringing of gun into pre-defined position in space have been achieved by Fire Control System (SUP) which enables targeting of mobile targets day and night and under all weather conditions. Tanks M-84A4 have SUP OMEGA-84 while other models dispose with SUV-M-84, both these systems mutually compatible. SUP represents automatic electro-hydraulic system for stabilization in two planes enabling gun movement on height with the speed of 70 mrad/s on direction of 285 mrad/s with accuracy of 0.2 mrad/s. 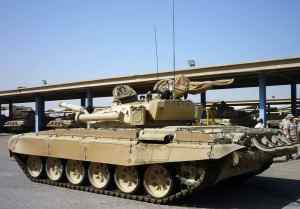 The key component of SUP is stabilized day and night targeting device with integrated daily channel, night channel with passive picture intensifier of the 2nd generation and laser distance measuring device up to 10000 m and accuracy of 10 m.
Antiballistic angles of multiple-layer configured front armour plate of the tank hull and powerful front part of the turret with silicate core provides high level protection against cumulative and kinetic projectiles. Additional anti-cumulative protection has been carried out by side armour plates on the hull and external equipment on turret. Compared with modern western tanks, tank M-84 has, due to its low profile, smaller front area, which makes him 15-20% smaller target. The level of anti-cumulative protection can be significantly increased by application of explosive reactive armour. 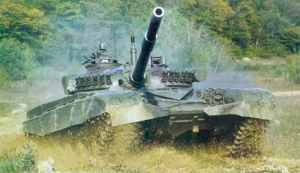 For the purpose of camouflage during battle activities, tank M-84 uses Smoke Pots Launchers for creation of smoke curtain. Integrated system of crew protection consists of automatic fire extinguisher, system of nuclear-chemical and biological detection and devices for hermetically safe protection, filtration and ventilation of the cockpit of the tank. 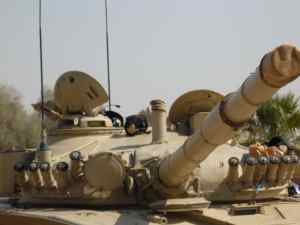 Tanks of the family M-84 are driven by 12-cylinder, four stroke engine, multiple fuel, water cooled, turbo charged diesel motor, power 574 kW (780 HP) for M-84 variant or 735 kW (1000 HP) for variant M-84A and M-84AB. It has mechanical transmission with multiplication and two side reduction gears, 7 speed gears forward and one in reverse, with hydraulic steering, independent hangings with torsion shafts and hydraulic shock absorbers. With its specific power of 17.5 kW/t tank M-84A surmounts slopes up to 58%, side slopes up to 47%, vertical wall up to 0.85 m and trenches up to 2.8 m width. The water obstacles up to 1.8 m deep are crossed without preparation while deep fords up to 5 m require 20 minutes preparation time. Intercom - device for mutual communication provides communication between crew members and external communication over receiver. 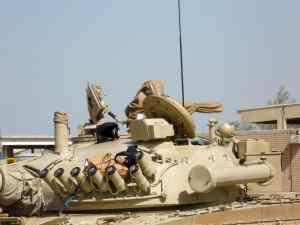 Tanks M-84 and M-84A are equipped with conventional FM and UHF receivers with frequency range of 20-79.975 MHz and 20 km range. 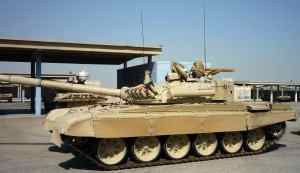 Tank M-84 AB is equipped with modern, interference resistant UHF receivers with narrow and wide band frequency hops (100 hops/s), frequency range 30-87.975 MHz (RACAL Jaguar V). Command tank M-84ABK has additional HF SSB/AM transciever with frequency range 1.6-29.999 MHz and external 1 kW power supply. 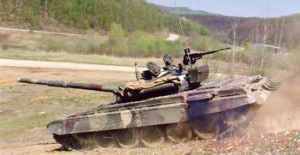 Tanks of the family M-84 are equipped with reconnaissance appliances, additional equipment for underwater drive, equipment for self digging, individual set of tools and appliances with possibility of attachment of mine sweeper. Navigational tank M-84ABN is equipped with terrestrial navigational system TELDIX. 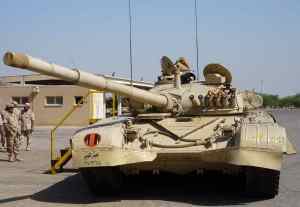 M-84AI and M-84ABI tanks belong to Recovery Vehicles with all conventional equipment being used by such kind of vehicles.